are particular to the Irish context. Analysis of the data for the third quarter has been carried out by Dr. Lucy Michael in consultation with Shane O’Curry, Director of ENAR Ireland. One hundred and twelve incidents in the iReport system in the three-month period of January to March 2014 were analysed. Seventeen of these were reported through another organisation, with the highest number (13) in this quarter (similarly to the last quarter) reported through NASC, the Irish Immigration Support Centre, which is based in Cork and serves the city and Munster region. With the establishment and promotion of the system throughout late 2013, cases reported are increasingly less likely to now include events which occurred before the first reporting period. There were just 6 reports in this quarter which referred to events occurring before July 2013, and only 12 which occurred in the latter half of 2013. Five of these occurred in December 2013 and were reported in early January. There was a highly consistent spread of reports throughout this quarter. The most common forms of racist incident reported in this quarter are shouting and strong language, and incidents involving internet and social media. The highest number of reports in this period came from North and South Dublin, and Cork. Incidents occurred more frequently during midweek days and daylight hours, particularly connected to encounters in public spaces. Victims were most likely to be aged between 25 and 55 years old, with a further significant number in mixed age groups, although the proportion decreased significantly when media and social media related cases were accounted for. Perpetrators were significantly more likely to be male than female in this period. Men and women were equally likely to experience racism, but again men experienced a higher proportion of incidents involving physical threat. People identifying or identified as Black-African accounted for the highest number of victims. 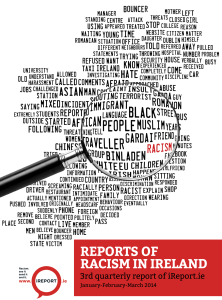 It is worth noting that victim numbers within this report do not fully capture the picture of secondary victimisation which occurs when family and friends who share a minority identity become aware of racial abuse. Racist language was common to 70 percent of the reported cases. Comments on the victim’s religion were made by perpetrators in 7 incidents. Levels of formal reporting via other recording systems were higher in this period, with 21 percent reported to Gardaí and 23 percent reported to other authorities or NGOs. The level of satisfaction with responses was low overall. Of those that reported to Gardai, 6 reported a positive response, 12 negative responses and 4 neutral. International research shows that victims require a great deal of public support, and confidence in the reporting system, to make formal reports. 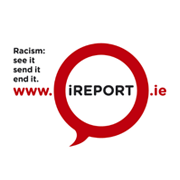 A slightly lower proportion of cases reported in this quarter to the iReport website were made by witnesses who had seen or heard about the incidents rather than by victims. However, it still constitutes a sizeable proportion at 46 percent. It is notable in this period that a significant number of reports were made by people identifying as White Irish on behalf of victims with whom they had no prior relationship. This period shows a rise in the proportion of cases reported by people with no relation to the person or people experiencing racism, probably due to the high number of mediated incidents reported. However there is also a significant rise in the proportion of cases reported to the Gar dai, including by victims. This reflects, at least in part, the higher number of assault cases in this period. The variable level of reporting across the country and between different groups should not be interpreted to accurately reflect relative victimisation levels. Language fluency, education levels and feelings of belonging each affect reporting behaviours by victims and witnesses.